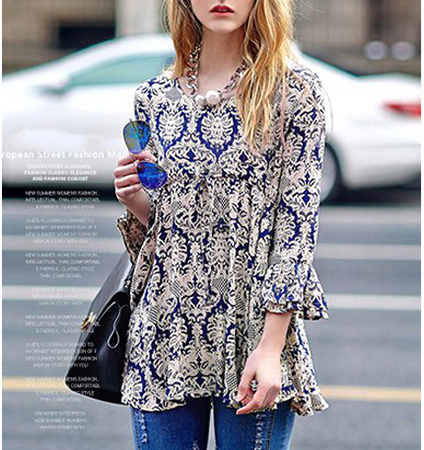 This women’s tunic top will quickly become one of your favorite wardrobe items. It is designed in a feminine style, is comfortable and looks incredible on! This top features a vee neckline and has a well-defined, elasticized waistline. The sleeves are three quarter length with ruffles at the ends. The bottom portion of the tunic is gently gathered at the waistline to provide a moderate amount of fullness. This tunic comes three color choices. Each has a baroque print. Select your favorite from navy and white, red and white or chocolate and white. The top is available for purchase in sizes Small, Medium, Large and Extra Large.